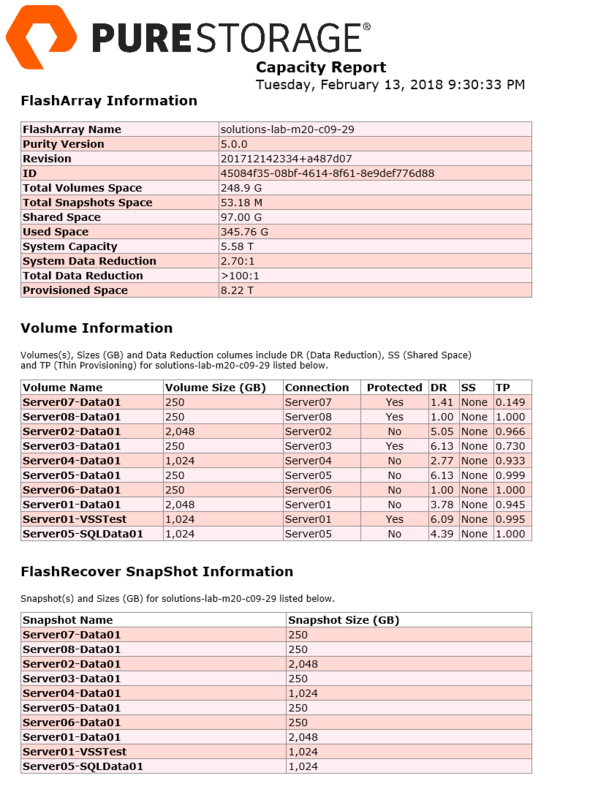 Information about the FlashArray such as Name, Purity Version, ID, System Capacity and more. Details about volumes such as Name, Size, Data Reduction, Thin Provisioning and Shared Space. 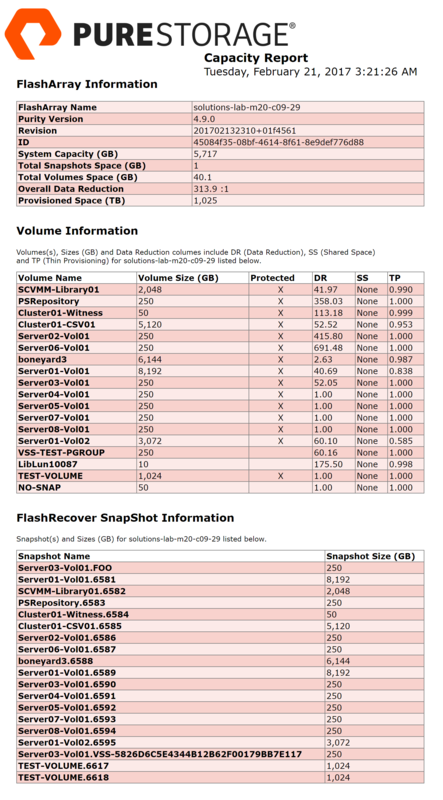 Volumes section has a Protected column to indicate if a volume is protected by a snapshot. Details about individual FlashRecover Snapshots. EndPoint — Flash Array IP or FQDN. Credential — Get-Credential or pass in a Secure Credential object. VolumeFilter — Filter out for a specific pattern of volume name. Eg. *Server*, finds anything with the word Server in the name. Default parameter value is “*” to include all volumes. Love the idea of the Capacity report.. attempting to give it a try this morning but running into a few issues..
1. Simple typo, the PS Command line listed above shows it as New-FlashArrayReport instead of New-FlashArrayCapacityReport. allowed range of 100. Supply an argument that is less than or equal to 100 and then try the command again. If you have requests for a feature log it on the Issues section of the GitHub repo (https://github.com/PureStorage-OpenConnect/powershell-toolkit/issues). The Volumes section contains the per volume actual data reduction value. Is this what you are looking for? I’ve been playing with this cmdlet today and as per Garrick’s question above I too would like to see the actual “used” figure for each LUN. In my case this is required because I’d like to provide the “used capacity / volume” to our ESX Administrators who cannot see how much space a LUN is actually consuming within the VSphere console where the Vsphere plugin is not installed. This is possible and I’ll get the cmdlet updated with a “Used” detail. Stay tuned. I’m just getting back into the office from an extended leave so should get to this next week. I have managed to add the “used” detail myself and in the process have learned a lot about powershell! I’ve also added a column to the LUN report to indicate whether a LUN is replicated off-site or not. At this point I just check to see if the LUN is in a Protection Group or not – there’s probably a better way of doing this…. New-FlashArrayCapacityReport : A parameter cannot be found that matches parameter name ‘Credential’. This is still an open issue on GitHub (https://github.com/PureStorage-OpenConnect/powershell-toolkit/issues/12). I am working on a new revision of the Toolkit for release later this week. This fix will be included in that release. I will post a blog about the additions to the Toolkit. Provisioned Space (TB) shows zero in Capacity Report. Still I am seeing the same error. Please contact me directly at barkz@purestorage.com. I can look at your FlashArray internally to get some details on what you are seeing, version of Purity, etc. My report pulls back the array information but no volume information or falshrecover information. Are there any dependencies I may have missed? I know we need to update our array to 4.8.12, could that be why? Did you install both the Pure Storage PowerShell SDK and the Toolkit? Being on 4.8.12 is fine. The SDK is compatible up to REST 1.7. Even if you are on a newer REST API version it will be backwardly compatible with 1.7. For example I run Purity 5.0 which is REST 1.12 without issue. This should show you all of your volumes on the FlashArray. I would also suggest joining our slack team via self-invite (https://pscodeinvite.azurewebsites.net). Jump into the #powershell channel and then we can have a quicker exchange so I can help you out. Is it possible to add a switch to compare two New-FlashArrayCapacityReport’s so its easy to see the deltas between the two reports so it makes it more simple to identify which volumes are growing? This would be a bit challenging because the output is dynamically built and then saved off as an HTML report. To make it easier I could create a parameter -OutputType [HTML\Excel]. If Excel is chosen then the data could be stored there and graphing etc could be done to compare, etc. I’m over simplifying this but its doable. -OutputType [HTML\Excel] sounds like a workable solution to me! I dont suppose you take requests? 🙂 Ill continue to pursue other solutions as well, thanks for the input. is the Snapshot Size section working as intended? It looks to be showing the exact same size as the initial Volume of the lun but in the GUI some luns either have no snapshots taken, so I would think snapshot size should read zero, or they have snapshots which the size of those snaps dont match what the script outputs. Barkz , First of all thank you…One of your commands helped me configure Capacity reports in our environment…. What are you looking for regarding FlashArray health checks? you so much, However I am encountering problems with your RSS. I don’t understand why I cannot join it. Is there anybody getting the same RSS issues? Sorry about the RSS feed, URL is https://www.purepowershellguy.com/?feed=rss2.